As I amply pointed out earlier (see my notes related to the February 2, 1999 recording), the city of Olympia in the state of Washington has always been a Fugazi favorite, the Capitol Theater a go-to venue with quite a bit of history. Presented here is their third out of four live gigs at the theater (cf. 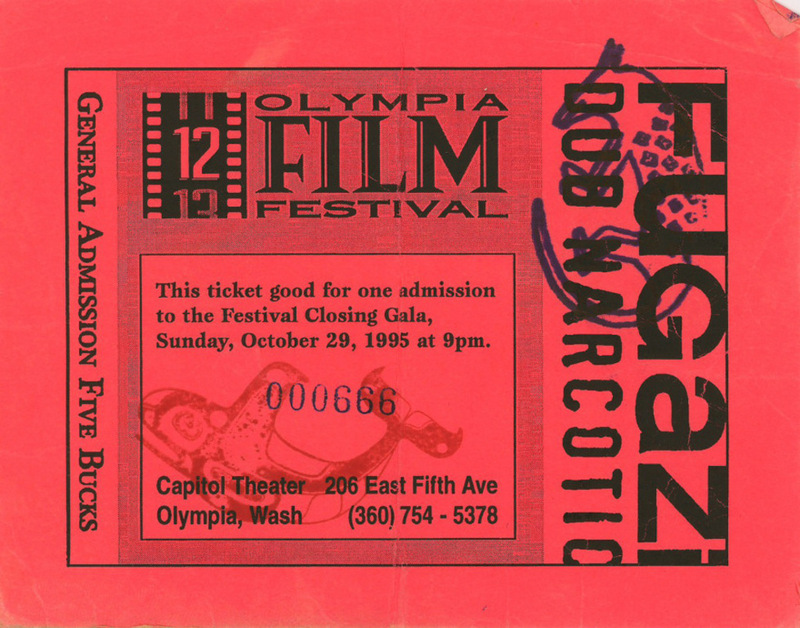 1991, 1993, 1995 and 1999) which played out as part of the Olympia Film Festival (see ticket stub above). There are 22 live tracks total, most off of Red Medicine (9), followed by Repeater (5), In on the Kill Taker (4), Steady Diet (2), and just one track off of the debut 7 Songs EP and 3 Songs seveninch. The instrumental Version opening the set is quite a treat, and even though the first part of the set is pretty much solid yet standard Fugazi fare (note that the recording skips during Cassavetes and that both Facet Squared and Bed For The Scraping suffer cuts merging incomplete versions of these songs), I feel the Long Division - Fell, Destroyed - By You sequence is what steps it up, pulling the listener in. A number of straight-up bangers add to the awesomeness and make the performance, which fortunately sounds really good as well, a memorable one. This version of Shut the Door is simply mind-bending and arguably the best one of the staple I have had the pleasure to listen to so far. The guitar play on Turnover is soaring, the timing flawless. Sound-man Joey Picuri works his subtle magic and beautifully catches some hall reverb on Sweet and Low, riding the ethereal and eerie. Also, as early as 1 minute 56 seconds into Glueman, Ian’s guitar cuts out unexpectedly, while Guy, Joe and Brendan jam on unperturbed, only to be joined again for the breakdown and full force apotheosis. To conclude, it can be mentioned that a certain Lance Bangs skillfully recorded a good part of the show. Quality footage of these songs can be retraced easily by searching the internet. A couple of these songs, i.e. Shut the Door and Song #1 are featured prominently as part of the impeccable Fugazi documentary Instrument by Jem Cohen. Very enjoyable show all the way through, especially if you've ever been curious what Glueman would sound like if the middle two-thirds had no guitar. Bought this after listening to the “Shut the Door” performance on Youtube many times in the past few months and I needed a mp3 version of it. Pretty good overall but maybe you’ll enjoy it more if your favourite albums are Red Medicine and In on the Kill Taker since the majority of the setlist are from those albums. Only downsides to this concert is that the end of “Facet Squared” and the first half of “Bed for Scraping” are missing and the recording has a skip in “Cassavetes”. The reworked versions of “Two Beats Off”, “Song #1”, “Sweet and Low” and “Glueman” are great. I also Enjoyed the faster versions of “Facet Squared” and “Smallpox Champion”. Includes the version of Shut the Door that appears in the Fugazi movie, "Instrument".